People are living longer than ever before thanks to continued medical breakthroughs and broad standard of living improvements. In fact, the World Health Organization estimated that between 2015 and 2050, the proportion of the world's population that is over 60 years in age will almost double from 12 percent to 22 percent, and that in just two years from now the number of people 60 and older will outnumber children under the age of 5. Here in the United States, around 10,000 Baby Boomers are turning 65 every single day, and roughly one in five Americans will be at least this age by 2030. Further, by 2035 it is expected that there will be more 65-year-olds in this country than people under the age of 18 for the first time in U.S. history. All of the above-mentioned projections will only add to concerns about the long-term sustainability of Social Security and Medicare, which along with rising life expectancy should highlight the growing importance of self-funding when it comes to achieving a comfortable and financially secure retirement. 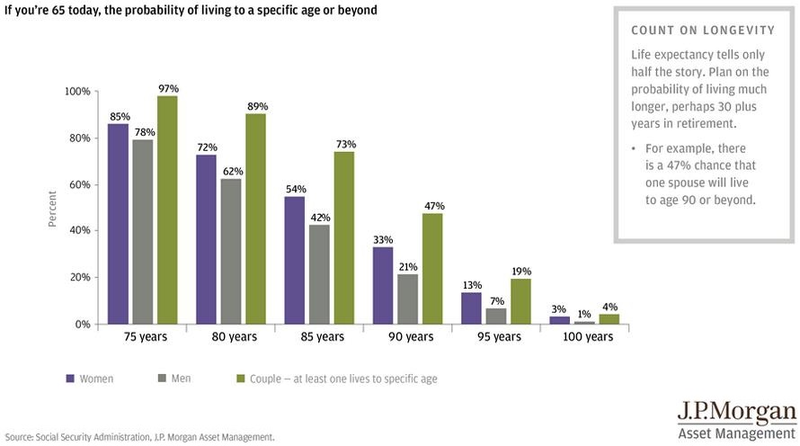 On the bright side, many Americans appear aware of the challenges associated with longer life spans. For example, nearly 4 in 10 (38 percent) U.S. workers surveyed recently by Wells Fargo said that they believe living past the age of 85 would create a financial hardship. Hopefully these individuals are already taking the necessary steps to address their concerns because 42 percent of surveyed workers reported that they anticipate living past the age of 85, including 10 percent who envision surpassing age 95. Some people understandably are not in any rush to think about such issues but from a financial standpoint, preparing early on for retirement is the best way to ensure an ideal standard of living in old age. Setting a financial goal during the past six months. Working toward a long-term goal. Feeling good about planning financial matters over the next one to two years. Preferring to save for retirement now rather than waiting until later. Surveyed workers who met all four of these requirements were found to be nearly twice as likely as those without a planning mindset to currently have a “thriving financial life.” Individuals with a planning mindset on average also had 3.1 times more retirement savings than respondents without a planning mindset, and were 42 percent less likely to report high levels of financial stress. The former is not too surprising considering that across all surveyed workers, 84 percent of those identified as having a planning mindset said that they regularly contribute to a retirement savings account, compared to just 66 percent for the rest of the sample.